EVGA is making a splash in the CPU cooling scene with the arrival of two closed looped solutions, one with a 120mm radiator and a single fan and the other with a 280mm radiator and dual fans. Both coolers feature fully sleeved tubing from the radiator to the CPU block. Like other all-in-one liquid cooling kits, these are self-contained units that do not require any filling, assembly, or maintenance—just mount and go. These coolers come with redesigned variable speed EVGA fans. The uniquely constructed fan blades sit in a curved housing that is supposed to reduce noise and improve airflow. They also sport Teflon nano bearings for a longer lifespan. 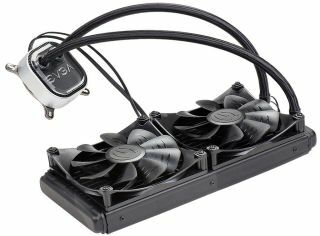 One thing that makes these coolers unique compared to other all-in-one coolers out there is that can be synced with certain EVGA GeForce GTX graphics cards. The benefit there is the ability to match RGB lighting with the two parts. EVGA also plans to release flow control software at a later date that will give users full control over these coolers, including fan speed, RGB lighting, pump control, profiles, and more. The new coolers support all modern Intel and AMD sockets, and come with a free AM4 bracket for when Ryzen ships in March. Both the CLC 120 ($90) and CLC 280 ($130) are available to order now direct from EVGA and are backed by 5-year warranties.